One of the most popular blogposts of all time on Tom Goom's website running-physio.com is on how to manage calf tears in runners. Is this because it is a really common problem, or because Tom wrote such a great blogpost? It's a bit hard to tell, and most likely it's a bit of both, but it begs the question "Why is calf pain one of the issues so many runners face? " 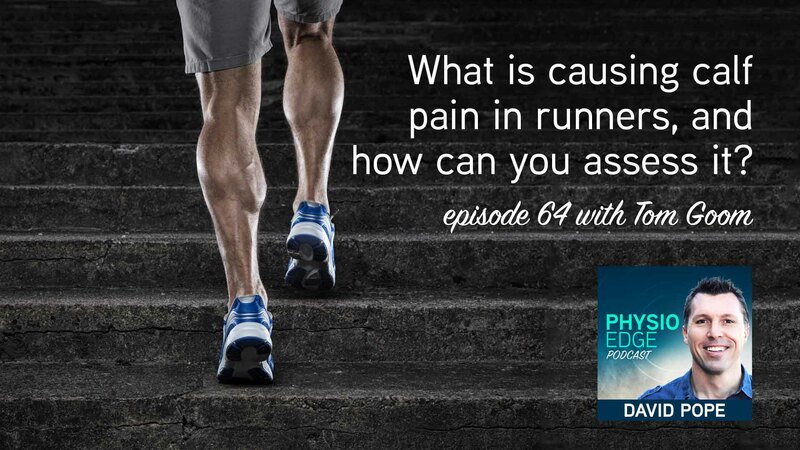 In episode 64 of the Physio Edge podcast, David Pope and Tom Goom discuss the latest research around calf pain in runners and what is actually going on. We want to give you all the tools you need to assess runners that present with calf pain, so we have included this in the episode as well. We also created a free handout with the info and assessment tests from this podcast, which you can download here. What is responsible for calf pain in runners? What will imaging show (or not show)? What happened to chronic exertional compartment syndrome (CECS)? Does it still exist? What is biomechanical overload syndrome, and how is it different to CECS? Who are the most likely culprits to experience calf pain? How can you assess runners with calf pain? What tests should you perform? How can you perform a calf capacity test?